A greater demand for child-related psychological services in schools, hospitals, mental health centers, and social services agencies will continue to push the career growth for school psychologists farther in the coming years. According to the Bureau of Labor Statistics (BLS), employment of clinical, counseling and school psychologists is currently expected to grow 11 percent from 2012 to 2022. What Type of Positions Can a School Psychologist Hold? The majority (81%) of school psychologists in the United States work in public school settings ranging from nursery schools to college university-level placement, where they typically assume positions as practitioners, administrators, and faculty/researchers. Other employment opportunities for a school psychologist are found at private schools, hospitals, private clinics, and school-based health and mental health centers. Others establish a private practice, and take on their own clients. Gaining employment at a residential treatment or juvenile justice program. Working at a community-based, day-treatment or residential clinics and hospitals. Teaching school students problem-solving skills, how to manage anger, learn self-regulation, and embrace optimism. Developing principles and techniques to address educational problems as an Early Intervention School Psychologist. Learn more about how to become a school psychologist. Elementary Schools: School psychologists help children overcome a fear of attending school; cope with the aftereffects of bullying; address a lack of self-discipline; improve poor study skills; remedy reading and writing difficulties; and build self-confidence. They also administer school-related psychological tests. 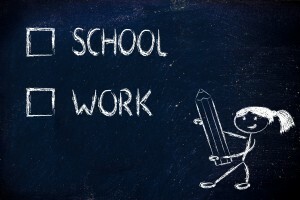 Middle and High Schools: Tween and teenage students in school often benefit from the guidance of a school psychologist, who can help with difficulties organizing their time efficiently; falling behind in schoolwork; depression and anxiety; those experimenting with drugs and alcohol; questions regarding sexuality; thoughts of suicide; communication issues; and those facing stressful situations, such as death, divorce, or dealing with the anxiousness that often comes when applying to college. College & Universities: School psychologists assist young adults in collegiate settings who are dealing with issues, such as drug and alcohol problems; worry over and feelings of alienation regarding sexual preferences; thoughts of suicide; questions related to their aptitude and abilities; and stressful situations, such as staying in school, maintaining grades, dealing with death, and/or getting a job after graduation. "Universities employ school-psychologists as college can be a very stressful time for young adults. Additionally, opportunities exist in community health centers, private clinics and hospitals." Education plays an important role in the hiring of school psychologists. Employers generally seek candidates that possess a master's, specialist (Ed. S. degree), or doctoral degree in school psychology. In most states, practicing psychologists require a license or certification. The attributes that a school psychology graduate demonstrates will also increase a job applicant's chances of getting hired. "Speak another language. I am always looking to hire bilingual psychologists [and] can never find enough. If you cannot acquire fluency in another language, obtain lots of culturally diver[sity]. Travel abroad and volunteer or try to obtain practicum experiences in interest areas." According to Heidi Kay, who provides pediatric staffing opportunities for school psychologists, professionals employed by a school-district are paid on a teachers' salary scale, based on years of experience, and usually with little room for pay based on merit. "One way that you can increase your hourly pay rate is to work on contract through a firm that specializes in pediatric therapy. This will allow you ultimate flexibility over your take home pay while simultaneously giving you the opportunity to work with a variety of student populations, in a wide range of geographic locations, if you so desire." Consider becoming an advisor to a student group, or advising an after school sport or activity. Consider writing a proposal to add an activity where there is need, and could use an advisor. Social networking sites allow school psychology students, recent graduates, and established professionals to network with others in the field. Reading blogs written by school psychologists also gives a different perspective of the field that textbooks may overlook. Conferences provide a valuable networking resource for school psychologists, and are offered on a local, regional, national, and international level. Attendees often participate in workshops, listen to keynote speakers, exchange research and ideas, as well as commingle during luncheon and dinner events. "…conferences are what you make them out to be. Find the subjects that pique your interest and follow through with meeting the presenter and obtaining contact information." Adams suggests participating in professional organizations on a state and national level. She also advises that students in a university program should network with already-established school psychologists in the field while they are still attending school. Joining a national association, and attending their conferences is also a help, says Adams. In addition to state-approved CE programs for psychologists, the APA provides continuing education programs for school psychologists. Some of the ways that a professional can develop his or her career include earning CE credits in topics such as Bullying Prevention; Contextual School Counseling Approach; and Behavioral Interventions in Schools: Evidence-Based Positive Strategies.